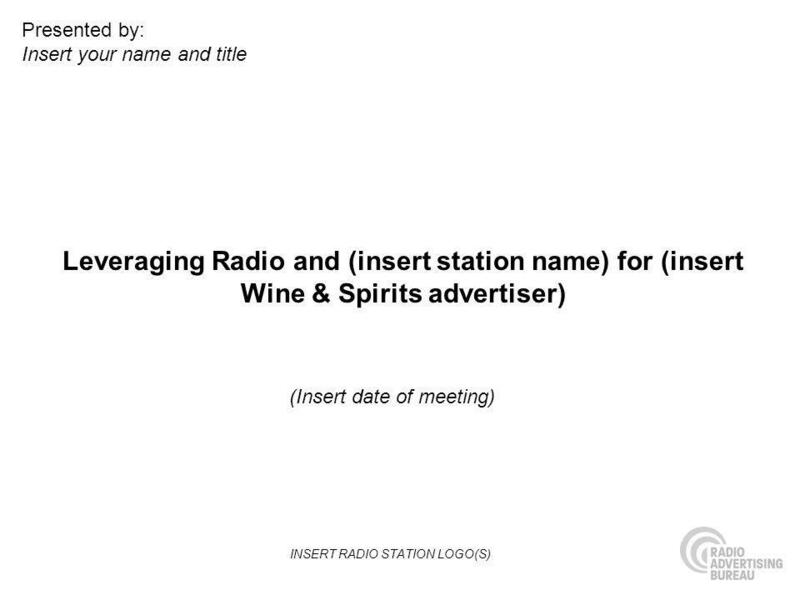 This presentation was created on a blank, basic PowerPoint template to allow you the ability to add graphics and branding (logos) for your station(s). 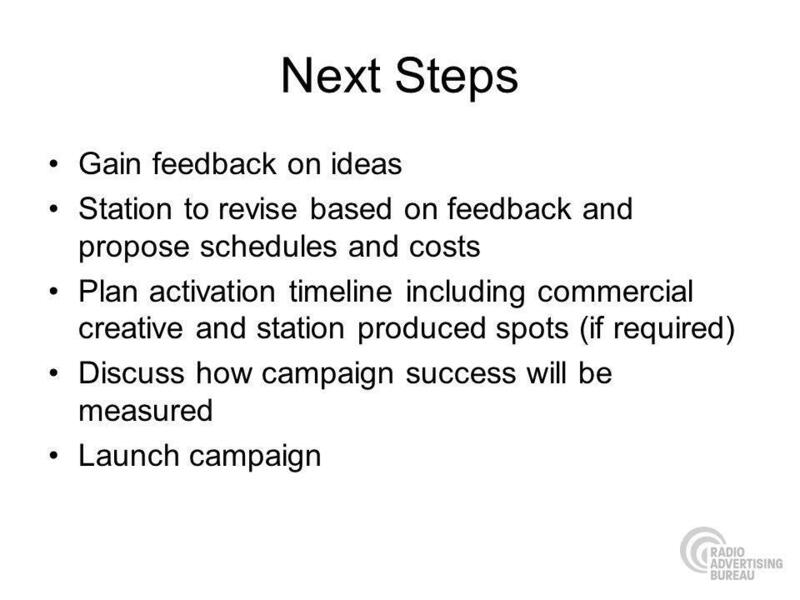 1 This presentation was created on a blank, basic PowerPoint template to allow you the ability to add graphics and branding (logos) for your station(s). You will also note that throughout, we indicate (insert advertiser here) or identify an advertiser as Advertiser X – please replace those with the name of the advertiser you are pitching. Please delete this slide prior to your presentation. Need assistance? Click below and send your questions. 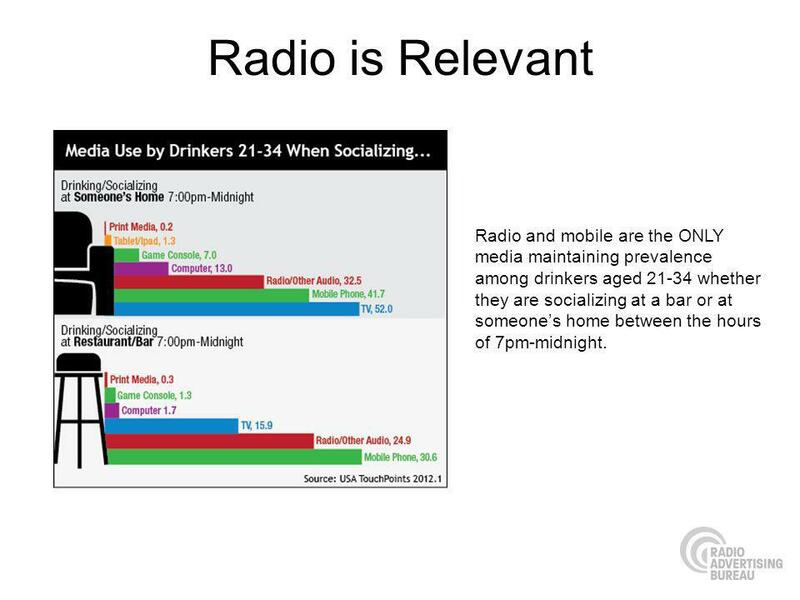 8 Radio is Relevant Radio and mobile are the ONLY media maintaining prevalence among drinkers aged 21-34 whether they are socializing at a bar or at someones home between the hours of 7pm-midnight. 12 Insight #1 The holidays bring the opportunity to celebrate with the ones you love. 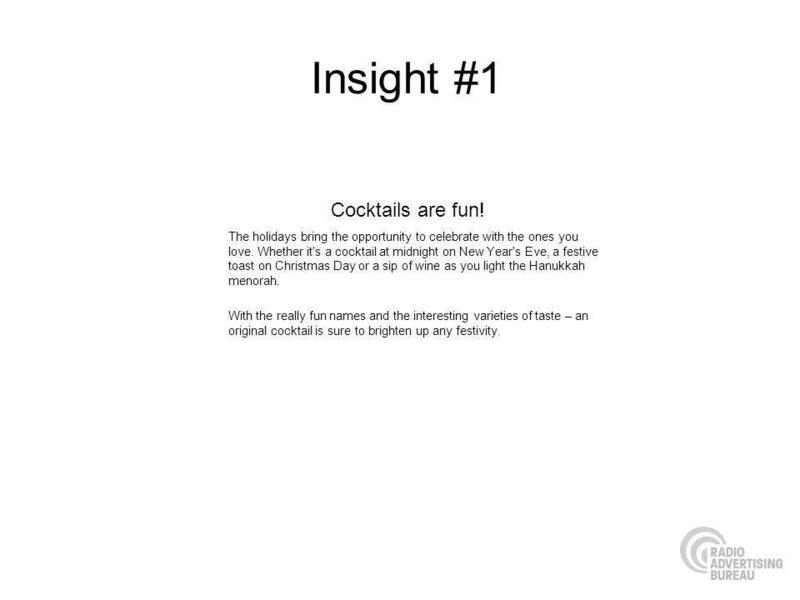 Whether it's a cocktail at midnight on New Year's Eve, a festive toast on Christmas Day or a sip of wine as you light the Hanukkah menorah. With the really fun names and the interesting varieties of taste – an original cocktail is sure to brighten up any festivity. Cocktails are fun! 13 Idea: Holiday Cocktail Competition With all the parties coming up this holiday season, there are tons of different seasonal drinks that make the rounds. 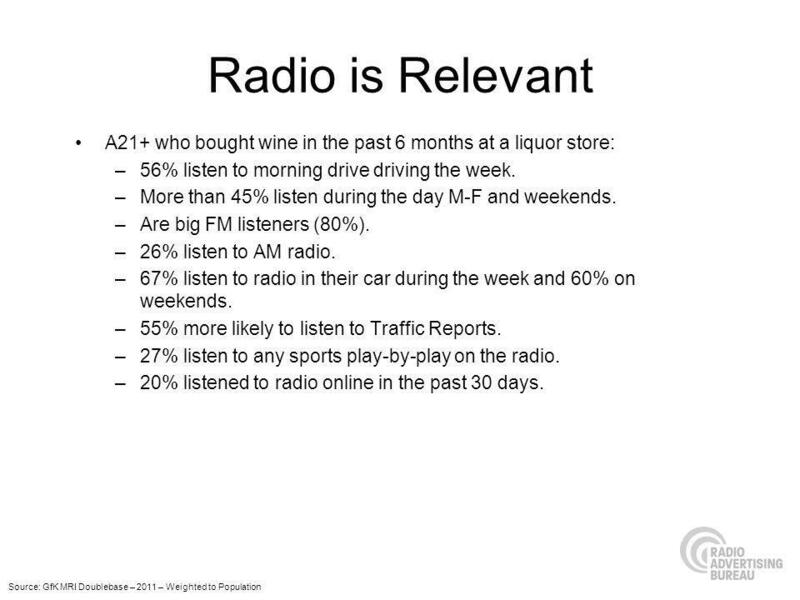 We all have our personal favorites, but Advertiser X and Radio station want to know…. Whats your signature holiday party cocktail? 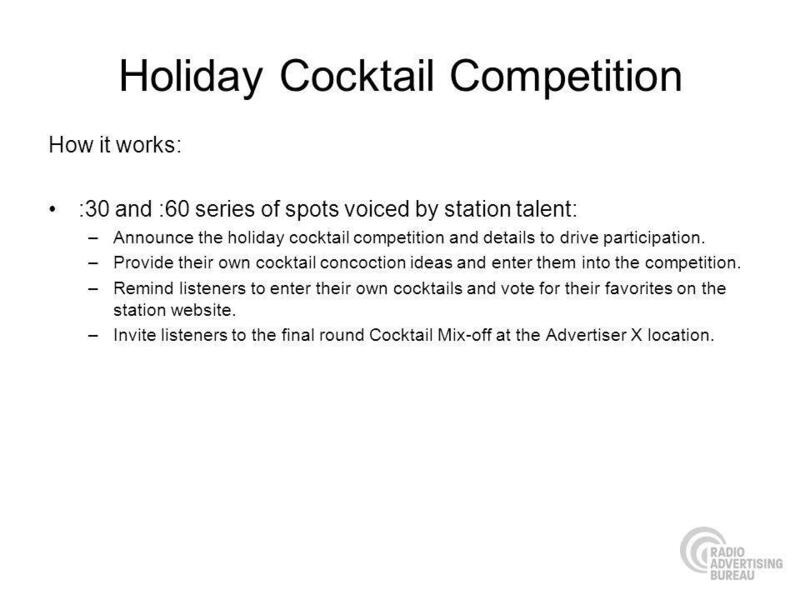 14 Holiday Cocktail Competition How it works: :30 and :60 series of spots voiced by station talent: –Announce the holiday cocktail competition and details to drive participation. 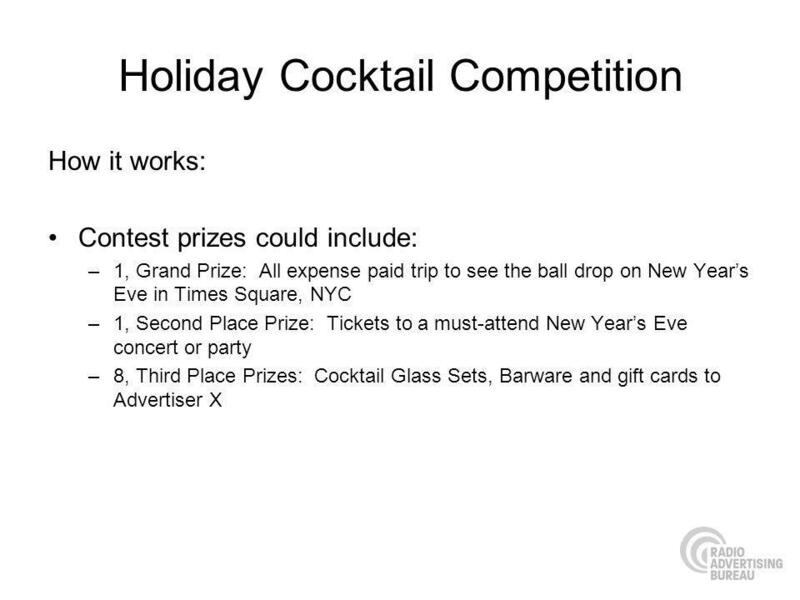 –Provide their own cocktail concoction ideas and enter them into the competition. 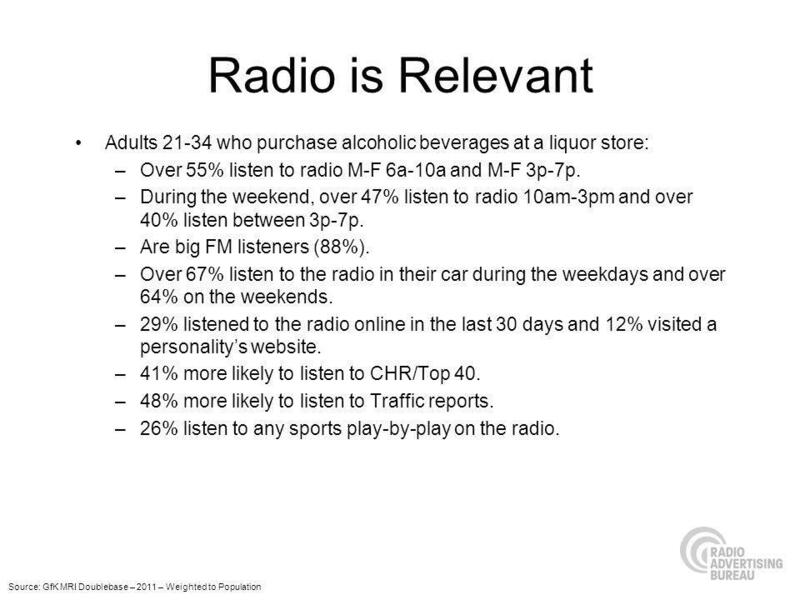 –Remind listeners to enter their own cocktails and vote for their favorites on the station website. –Invite listeners to the final round Cocktail Mix-off at the Advertiser X location. 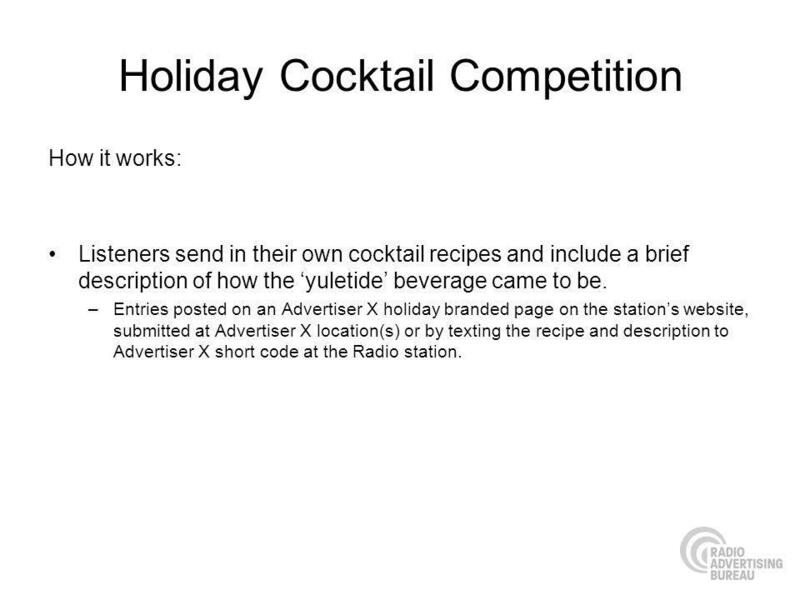 15 Holiday Cocktail Competition How it works: Listeners send in their own cocktail recipes and include a brief description of how the yuletide beverage came to be. –Entries posted on an Advertiser X holiday branded page on the stations website, submitted at Advertiser X location(s) or by texting the recipe and description to Advertiser X short code at the Radio station. 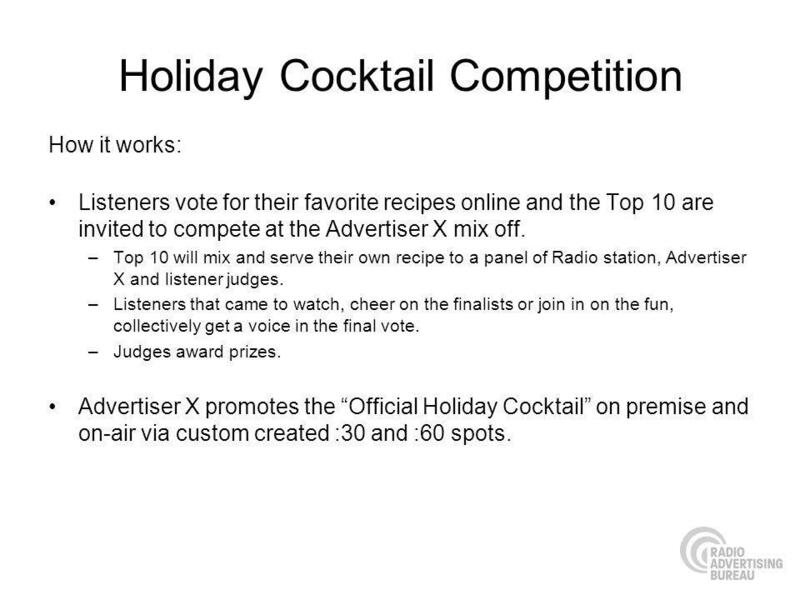 17 Holiday Cocktail Competition How it works: Listeners vote for their favorite recipes online and the Top 10 are invited to compete at the Advertiser X mix off. –Top 10 will mix and serve their own recipe to a panel of Radio station, Advertiser X and listener judges. –Listeners that came to watch, cheer on the finalists or join in on the fun, collectively get a voice in the final vote. –Judges award prizes. 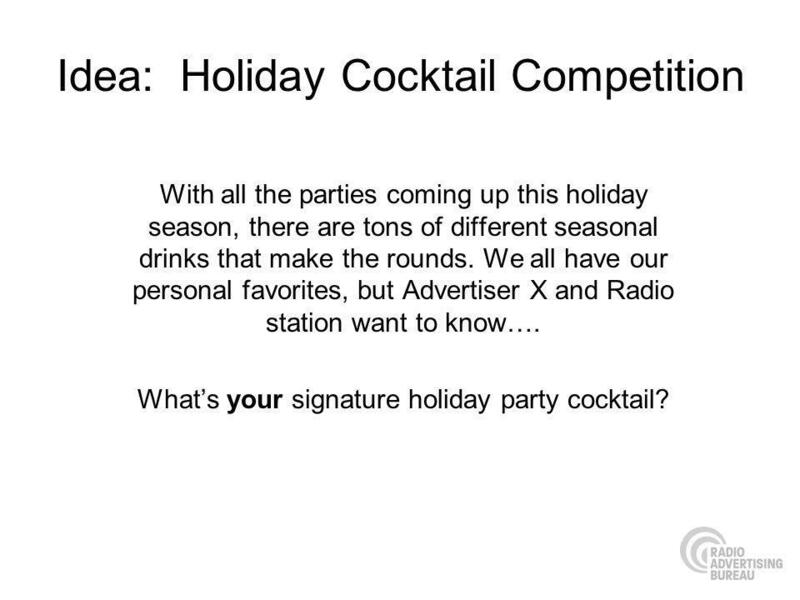 Advertiser X promotes the Official Holiday Cocktail on premise and on-air via custom created :30 and :60 spots. 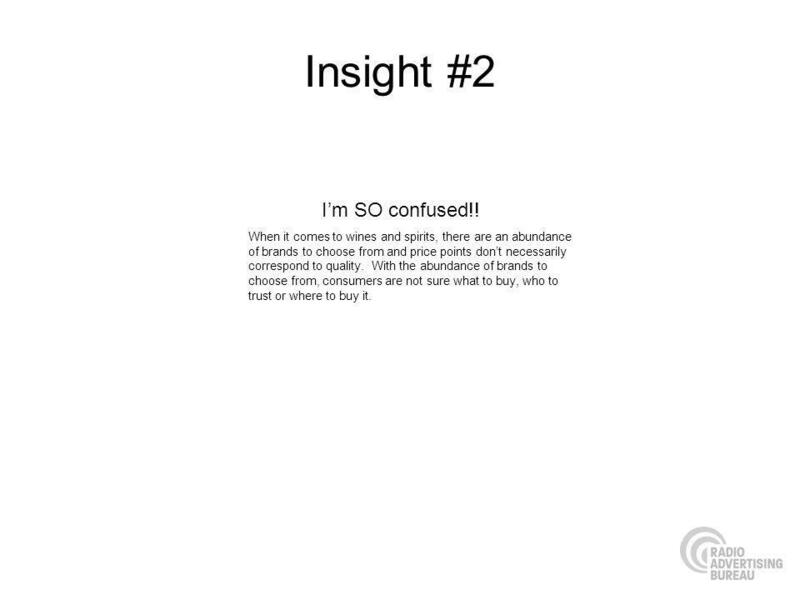 18 Insight #2 When it comes to wines and spirits, there are an abundance of brands to choose from and price points dont necessarily correspond to quality. With the abundance of brands to choose from, consumers are not sure what to buy, who to trust or where to buy it. Im SO confused!! 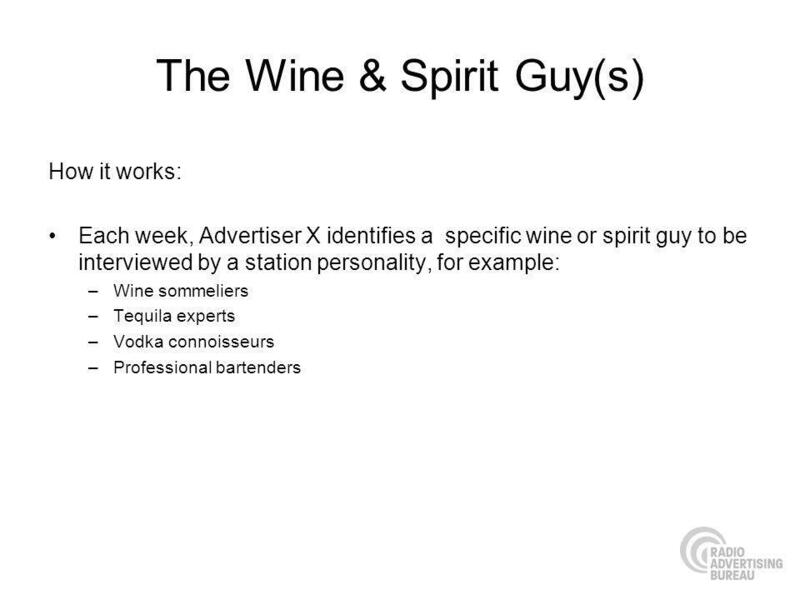 19 Idea: The Wine & Spirits Guy(s) Radio station personalities talk weekly with Advertiser Xs specialists (sommeliers, connoisseurs, chefs, etc.) 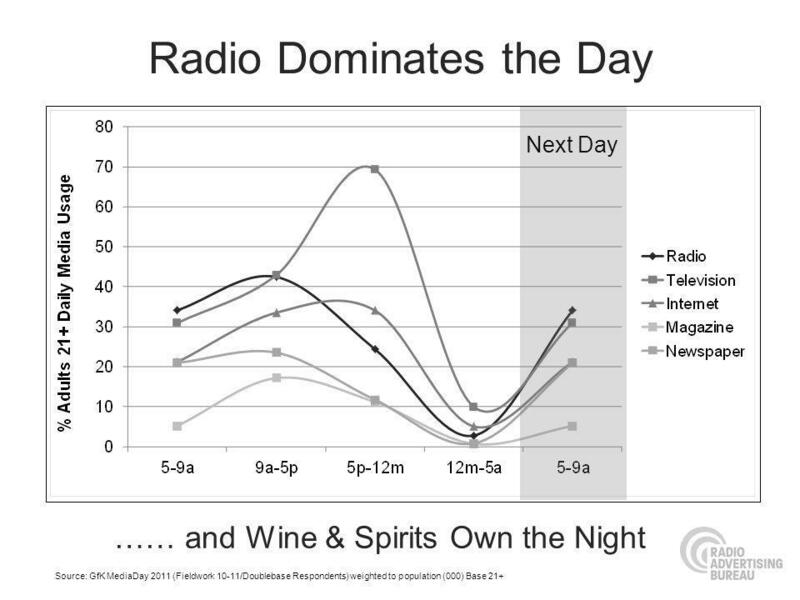 on various wines and spirits. 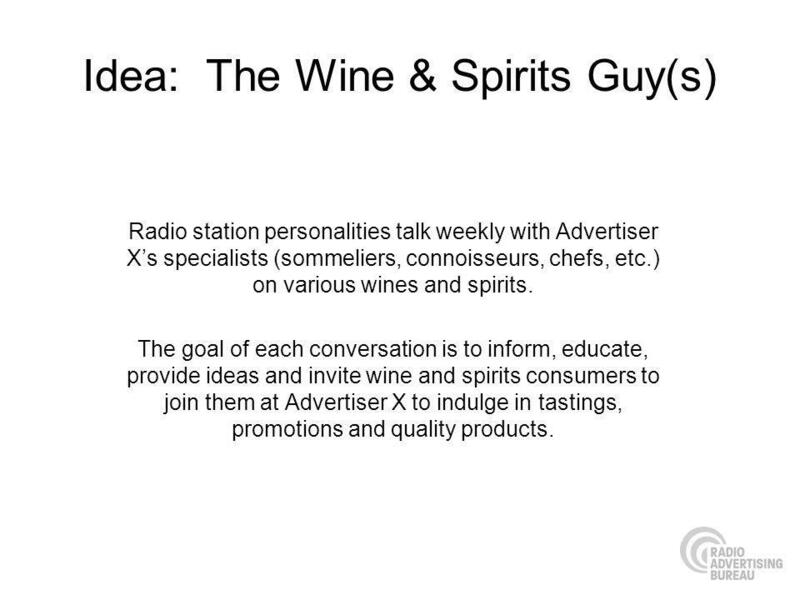 The goal of each conversation is to inform, educate, provide ideas and invite wine and spirits consumers to join them at Advertiser X to indulge in tastings, promotions and quality products. 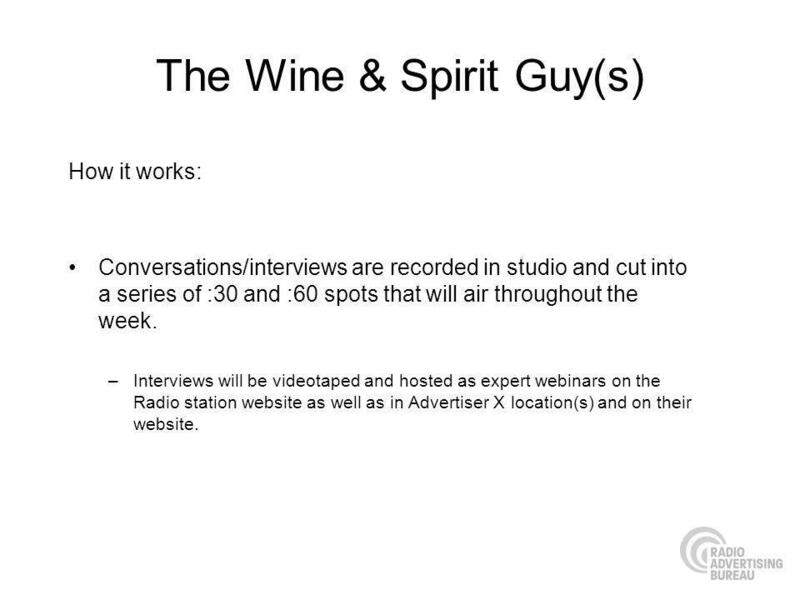 21 The Wine & Spirit Guy(s) How it works: Conversations/interviews are recorded in studio and cut into a series of :30 and :60 spots that will air throughout the week. 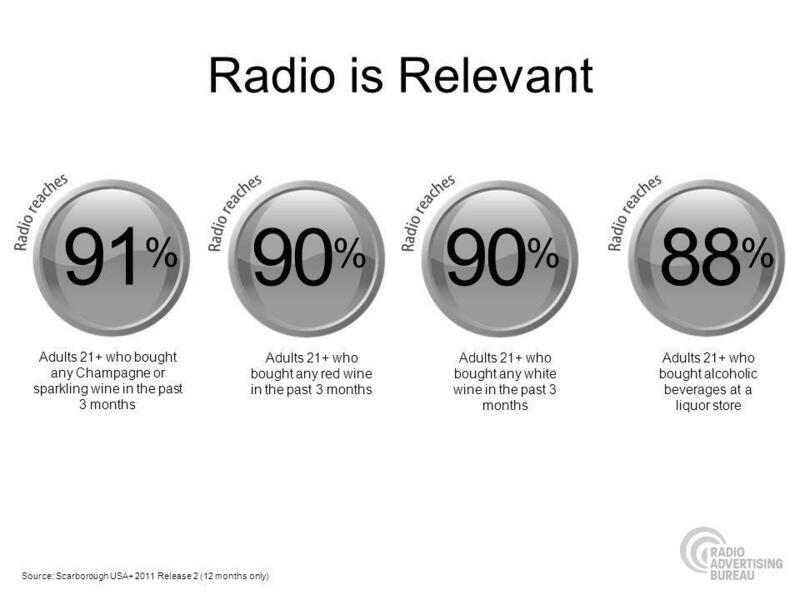 –Interviews will be videotaped and hosted as expert webinars on the Radio station website as well as in Advertiser X location(s) and on their website. 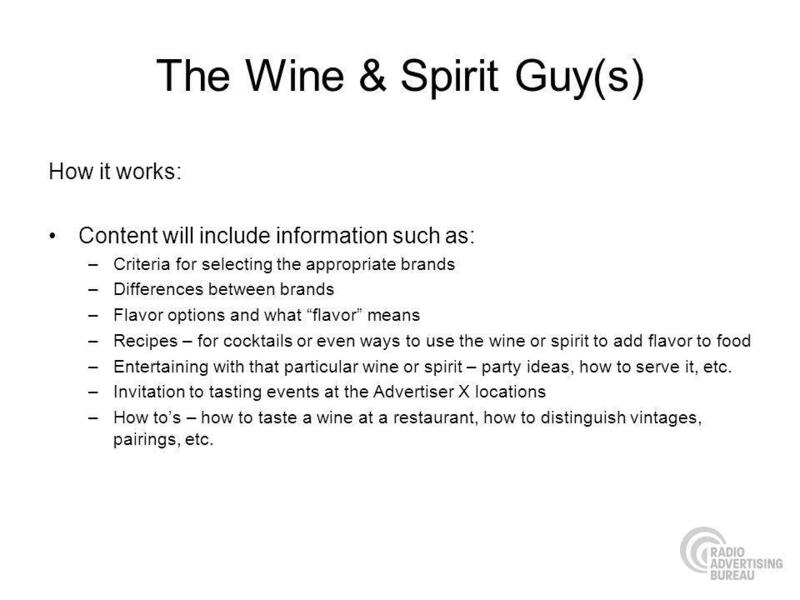 22 The Wine & Spirit Guy(s) How it works: Content will include information such as: –Criteria for selecting the appropriate brands –Differences between brands –Flavor options and what flavor means –Recipes – for cocktails or even ways to use the wine or spirit to add flavor to food –Entertaining with that particular wine or spirit – party ideas, how to serve it, etc. 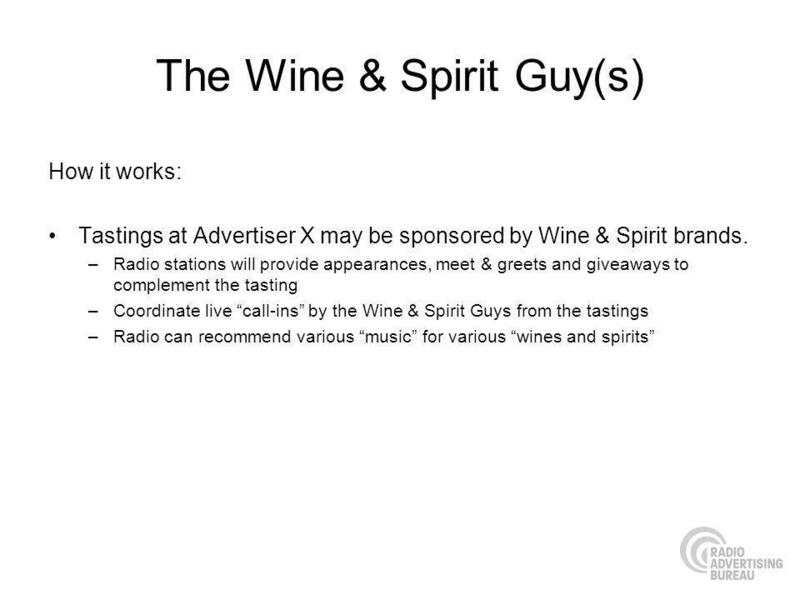 –Invitation to tasting events at the Advertiser X locations –How tos – how to taste a wine at a restaurant, how to distinguish vintages, pairings, etc. 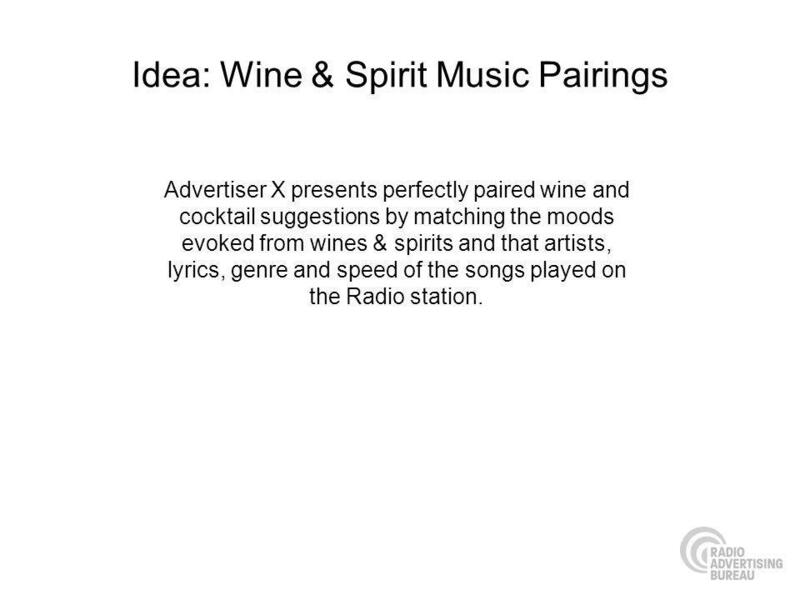 25 Idea: Wine & Spirit Music Pairings Advertiser X presents perfectly paired wine and cocktail suggestions by matching the moods evoked from wines & spirits and that artists, lyrics, genre and speed of the songs played on the Radio station. 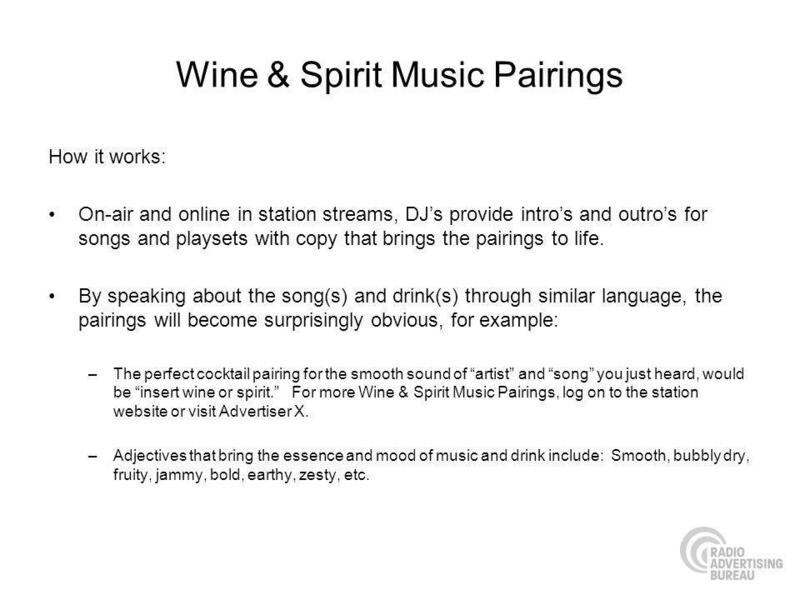 27 Wine & Spirit Music Pairings How it works: On-air and online in station streams, DJs provide intros and outros for songs and playsets with copy that brings the pairings to life. 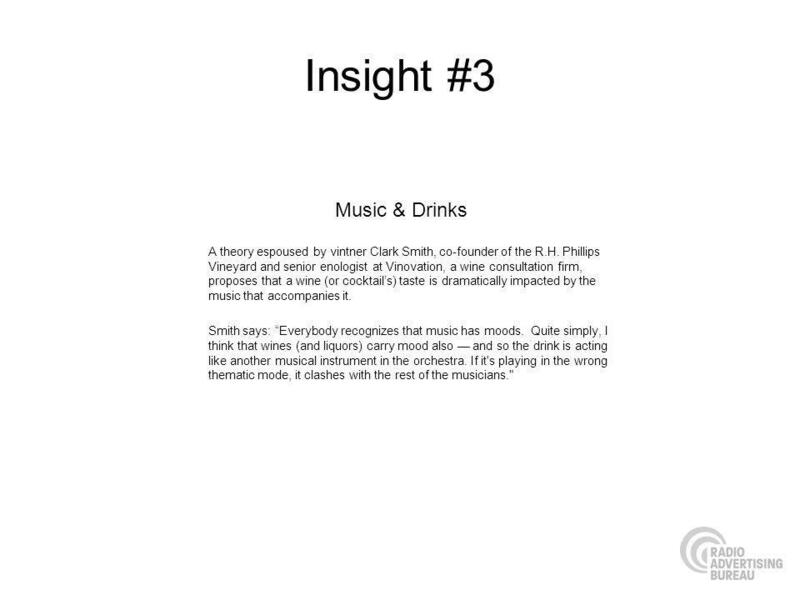 By speaking about the song(s) and drink(s) through similar language, the pairings will become surprisingly obvious, for example: –The perfect cocktail pairing for the smooth sound of artist and song you just heard, would be insert wine or spirit. 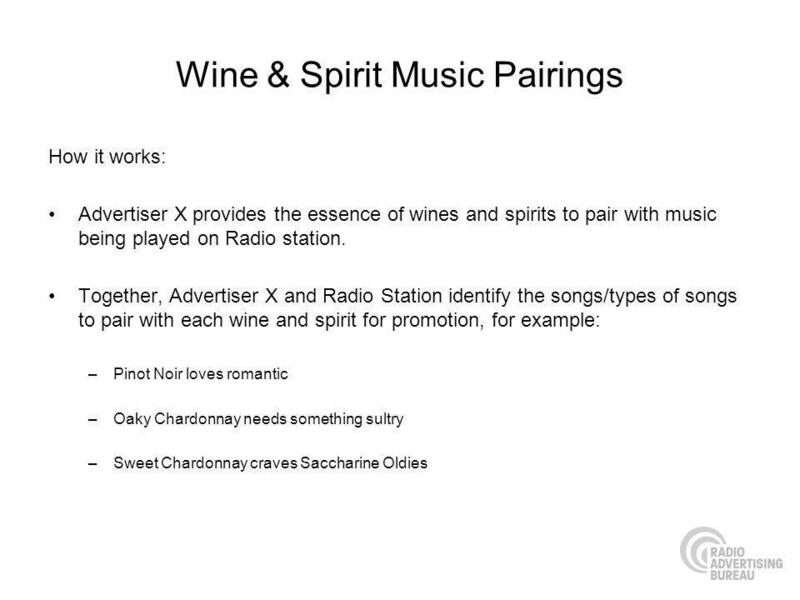 For more Wine & Spirit Music Pairings, log on to the station website or visit Advertiser X. –Adjectives that bring the essence and mood of music and drink include: Smooth, bubbly dry, fruity, jammy, bold, earthy, zesty, etc. 28 Wine & Spirit Music Pairings How it works: Creation of a Wine & Spirit Music Pairings guide featuring music to pair with a variety of products available at Advertiser X. –Guide produced by the Radio Station and distributed at Advertiser X locations. 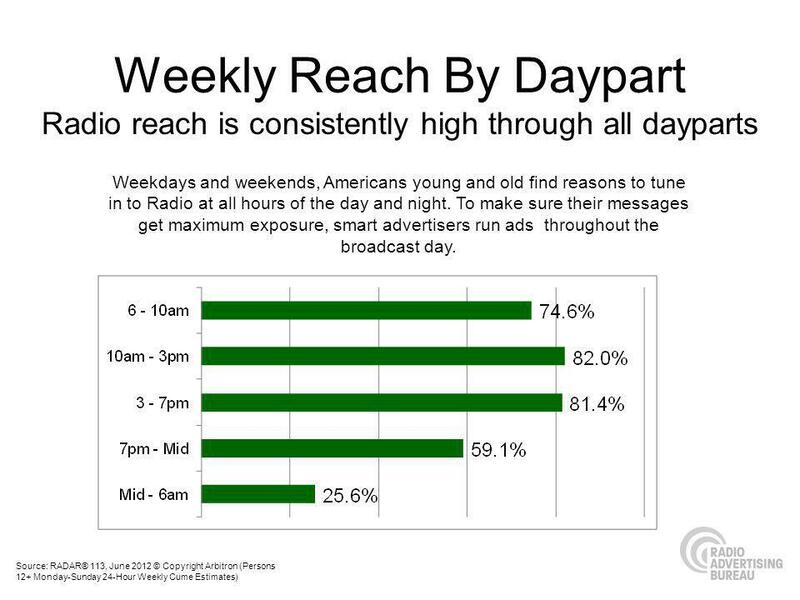 –Promotional spots drive listeners to Advertiser X to pick up the free guide. 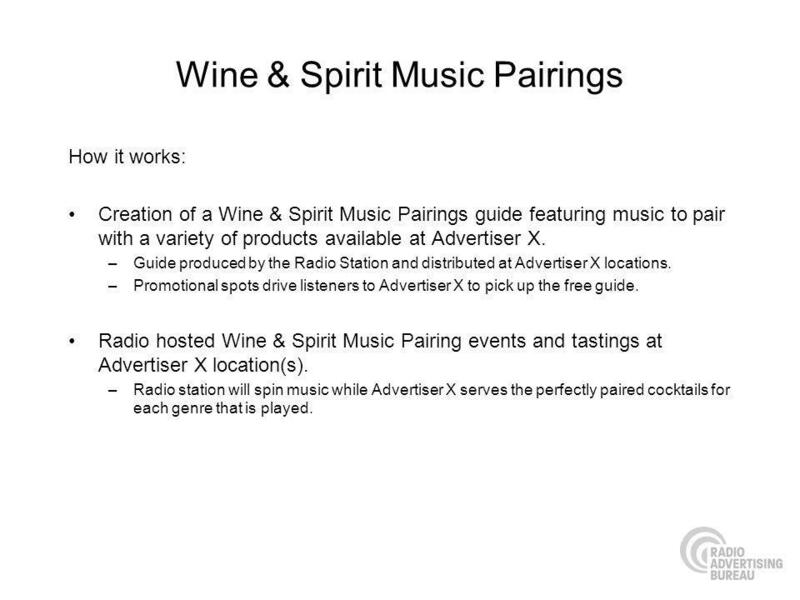 Radio hosted Wine & Spirit Music Pairing events and tastings at Advertiser X location(s). 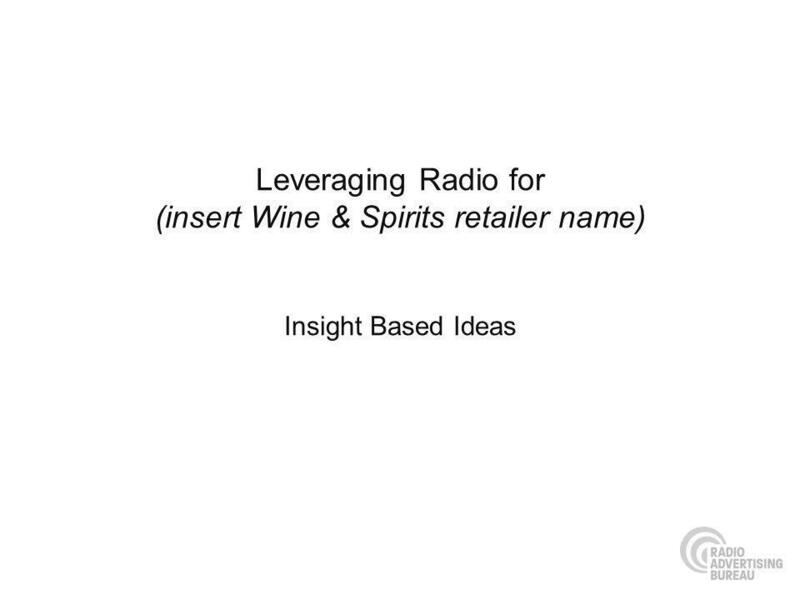 –Radio station will spin music while Advertiser X serves the perfectly paired cocktails for each genre that is played. 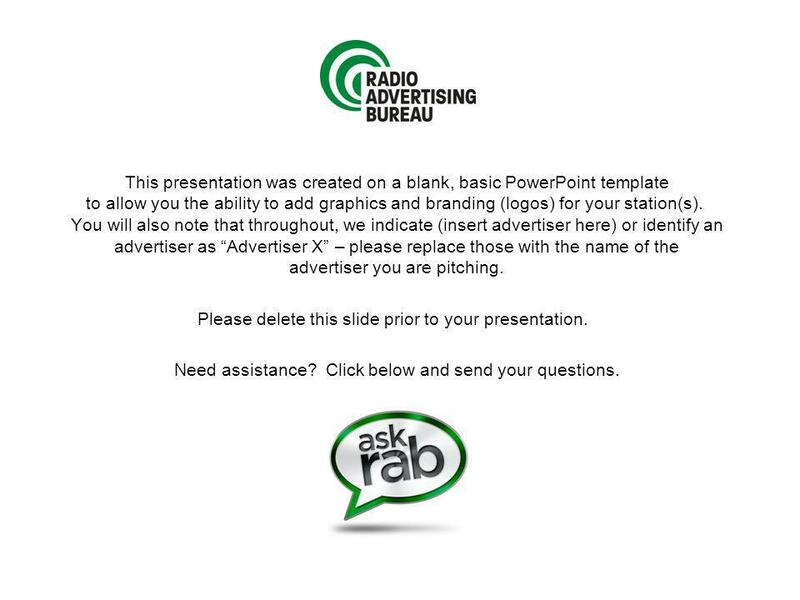 Download ppt "This presentation was created on a blank, basic PowerPoint template to allow you the ability to add graphics and branding (logos) for your station(s)." 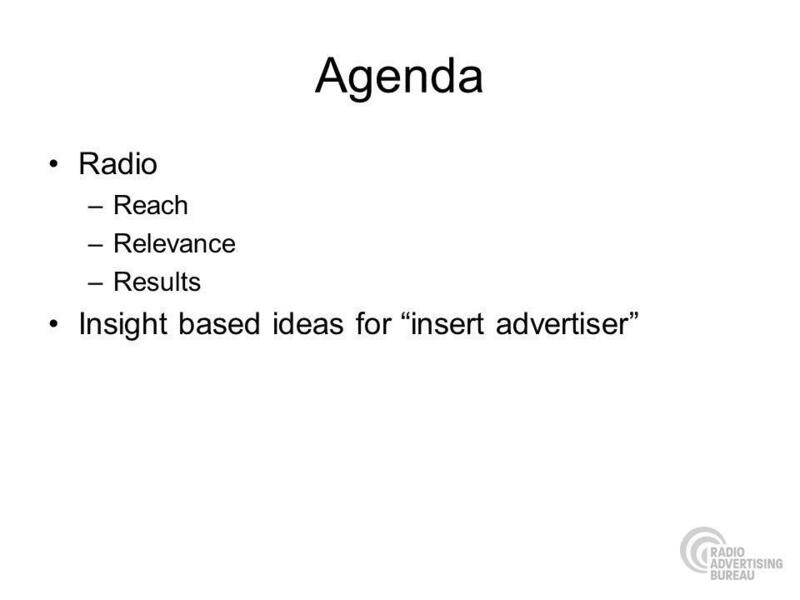 Please delete this slide prior to your presentation. August 20, 2013 Summary. 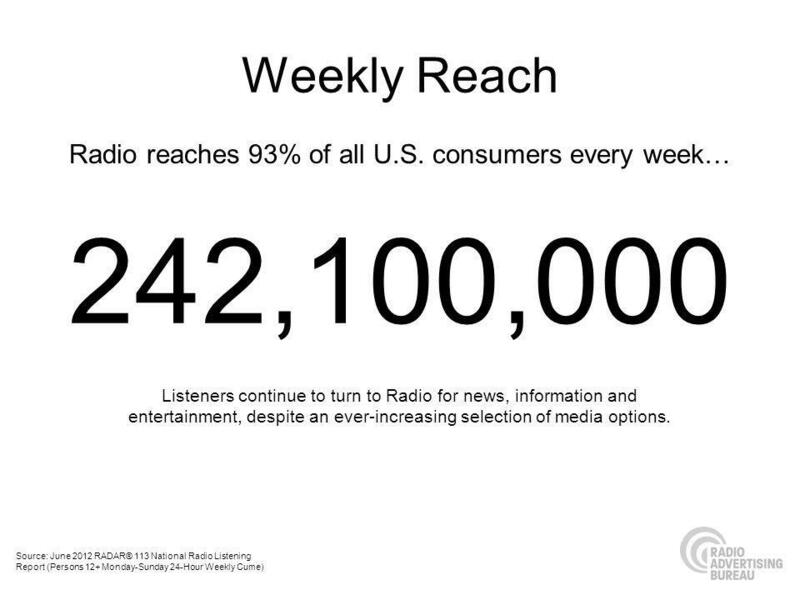 92% 242 million Broadcast Radio reaches over 92% or 242 million of the U.S. population every week! And its reach has remained.